Trillium (trillium, wakerobin, tri flower, birthroot, birthwort) is a genus of perennial flowering plants native to temperate regions of North America and Asia. It was formerly treated in the family Trilliaceae or trillium family, a part of the Liliales or lily order. The APG III system includes Trilliaceae in the family Melanthiaceae, where can be treated as the tribe Parideae. Plants of this genus are perennial herbs growing from rhizomes. They produce scapes which are erect and straight in most species. There are three large bracts arranged in a whorl about the scape. There are no true aboveground leaves. There are sometimes scalelike leaves on the underground rhizome. The leaflike bracts are photosynthetic and are sometimes called leaves. The inflorescence is a single flower. There are two subgenera. In T. subg. Trillium the flowers are mostly born on a short stalk (pedicellate) whereas in T. subg. Phyllantherum the flowers are born directly on the bracts (sessile). The flower has three green or reddish sepals and usually three petals in shades of red, purple, pink, white, yellow, or green. There are six stamens at the center. There are three stigmas that are borne on a very short style, if any. The fruit is fleshy and capsule-like or berrylike. The seeds have large, oily elaiosomes. Trilliums are myrmecochorous, with ants as agents of seed dispersal. Ants are attracted to the elaiosomes on the seeds and collect them and transport them away from the parent plant. The seeds of Trillium camschatcense and T. tschonoskii, for example, are collected by the ants Aphaenogaster smythiesi and Myrmica ruginodis. Sometimes beetles interfere with the dispersal process by eating the elaiosomes off the seeds, making them less attractive to ants. Picking parts off of a trillium plant can kill it even if the rhizome is left undisturbed. Some species of trillium are listed as threatened or endangered and collecting these species may be illegal. Laws in some jurisdictions may restrict the commercial exploitation of trilliums and prohibit collection without the landowner's permission. In the US states of Michigan and Minnesota it is illegal to pick trilliums. In New York it is illegal to pick the red trillium. While it is a popular belief that it is illegal to pick the common Trillium grandiflorum (white trillium) in Ontario, it is actually only protected in provincial parks and on land owned by conservation authorities. 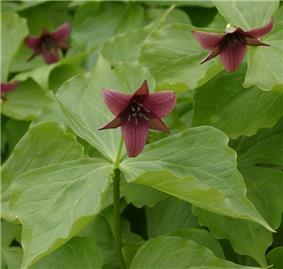 However, the rare Trillium flexipes (drooping trillium) is protected by law in Ontario, because of its very small Canadian population. High white tail deer population density decreases or eliminates trillium in an area. Several species contain sapogenins. They have been used traditionally as uterine stimulants, the inspiration for the common name birthwort. In a 1918 publication, Joseph E. Meyer called it "beth root", probably a corruption of "birthroot". He claimed that an astringent tonic derived from the root was useful in controlling bleeding and diarrhea. A white trillium serves as the emblem and official flower of the Canadian province of Ontario. It is an official symbol of the Government of Ontario. The large white trillium is the official wildflower of Ohio. ; in light of their shared connection to the flower, the Major League Soccer teams in Toronto and Columbus compete with each other for the Trillium Cup. ^ Zomlefer, Wendy B.; Williams, Norris H.; Whitten, W. Mark; Judd, Walter S. (2001). "Generic Circumscription and Relationships in the Tribe Melanthieae (Liliales, Melanthiaceae), with Emphasis on Zigadenus: Evidence from ITS and trnL-F Sequence Data". American Journal of Botany 88 (9): 1657–1669. ^ Ohara, M. and S. Higashi. (1987). species (Liliaceae).TrilliumInterference by ground beetles with the dispersal by ants of seeds of The Journal of Ecology 75(4) 1091–98. ^ a b O'Connor, R. P. and M. R. Penskar. 2004. (painted trillium).Trillium undulatumSpecial plant abstract for Michigan Natural Features Inventory, Lansing, MI, USA. ^ 2005 Minnesota Code – 18H.18 — Conservation of Certain Wildflowers. US Codes and Statutes: Minnesota. ^ Nuffer, B. Red Trillium. New York State Conservationist. April, 2009. New York State Department of Environmental Conservation. ^ Ferguson, R. Illegal to pick a trillium? Not quite. Toronto Star. May 31, 2009. ^ Meyer, J. E. The Herbalist and Herb Doctor. Hammond, IN: Indiana Herb Gardens, 1918, p. 50. McKelvie, D. Woodland Plants: The Trillium. Ontario Woodlot Association.